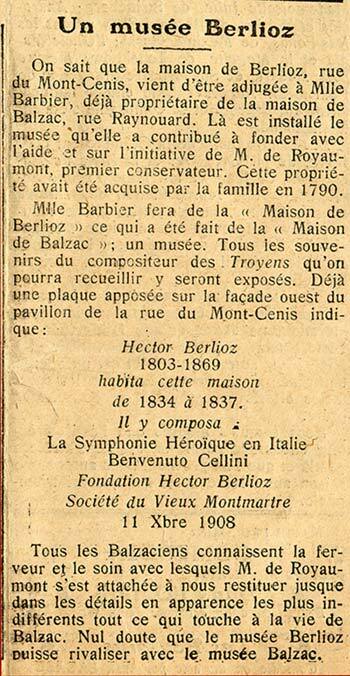 This page reproduces the original text of a report on the acquisition in 1922 of Berlioz’s home in Montmartre which was intended to become a museum. On the history of this house in the early XXth century reference should be made to the page on Berlioz at Montmartre. The text of the report and the accompanying image have been scanned from our own copy of the issue of 4 august 1922 of the Comædia, and are reproduced below together with our English translation of the report. NB: In the original text Berlioz’s second symphony, Harold en Italie, has been incorrectly described as Symphonie Héroïque en Italie. We have rectified the error in our translation. As is well known, Berlioz’s home, in rue Mont-Cenis, has just been sold by auction to Mlle Barbier, who already owns Balzac’s home, in rue Raynouard. That is the location of the museum which she helped to found with the assistance and on the initiative of M. Royaumont, its first curator. This property had been acquired by the family in 1790. All Balzacians know the dedication and care with which M. de Royaumont has endeavoured to reproduce for us everything relating to Balzac’s life, down to the seemingly most trivial detail. The Berlioz museum will no doubt be able to emulate the Balzac museum. The Hector Berlioz Website was created by Monir Tayeb and Michel Austin on 18 July 1997; this page created on 10 April 2009.